If you are looking to up your unicorn drink game then Captain Morgan has you covered. From multicolored drinks to food and make up products, the unicorn and rainbow trend has reached new heights on social media. For 21 years old and older fans of the trend looking for an elevated drinking option, Captain Morgan has cocktail that will satisfy all of their colorful cravings. 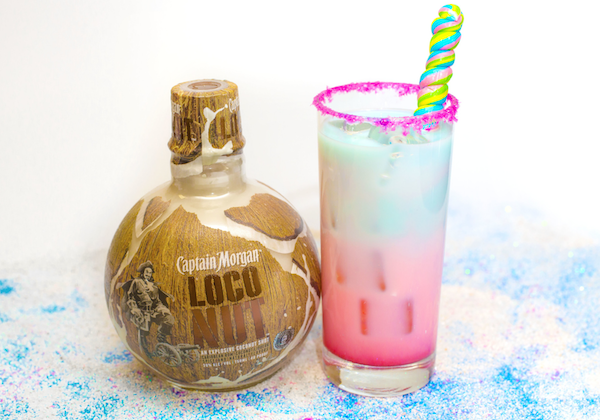 The Loco Unicorn cocktail is made with the new Captain Morgan LocoNut and looks like sparkly, liquid cotton candy and tastes like a sweet, coconut creation. Captain Morgan LocoNut is a summer-inspired shot that blends Caribbean rum and spices with seasonal flavors – including real coconut liqueur. Instructions: Wet the rim of a 13 oz. highball glass with water and dip the glass in edible glitter to form a rim. Fill the glass with ice, and then add the coconut water and Captain Morgan LocoNut. Stir with a straw or spoon. Drizzle the Grenadine over the cocktail first so it sits at the bottom, and then drizzle the Curacao second, so it sits on the top. Print article This entry was posted by Art Eddy III on April 26, 2017 at 10:22 am, and is filed under Lifestyle. Follow any responses to this post through RSS 2.0. Both comments and pings are currently closed.